International PartnershipsSharing skills and best practice, friends and collaborators worldwide include Junkanoo artists from the Bahamas, Fratelli Cinquini from Viareggio, Italy, Embaixadores da Alegria from Rio and more. Disability and InclusionThe New Carnival Company's lively and inclusive carnival group 'VIVA!' performs at local events. They meet all year round to create ideas, lanterns, costumes, dance and play samba drum. Training and DevelopmentVisiting carnival artist Ray Mahabir from London-based Sunshine Arts advises on carnival form and structure at a workshop at our creative base, the Coaching House in Ryde. Isle of Wight Mardi GrasOur own unique blend of New Orleans Mardi Gras spiced with flavours of Latin and Caribbean carnivals, our flagship Carnival in Education project takes to the streets of Ryde every last Saturday in June. The New Carnival Company is a pioneering arts development organisation based on the Isle of Wight specialising in carnival and outdoor public celebrations. We are a team of highly experienced carnival artists and producers, teachers and trainers, project managers and outdoor event specialists who believe that carnival and other forms of celebratory arts can make a real difference to people and places. We are based at The Coaching House in Ryde, a creative workspace and administrative suite with facilities for production, teaching and small scale conferencing. We deliver an extensive community outreach and carnival arts training programme across the island, the South of England, nationally and internationally. We are proud to be part of Arts Council England’s National portfolio and share their vision of Achieving great art for everyone. 2 miles of animated river bank and countryside along the River Yar. 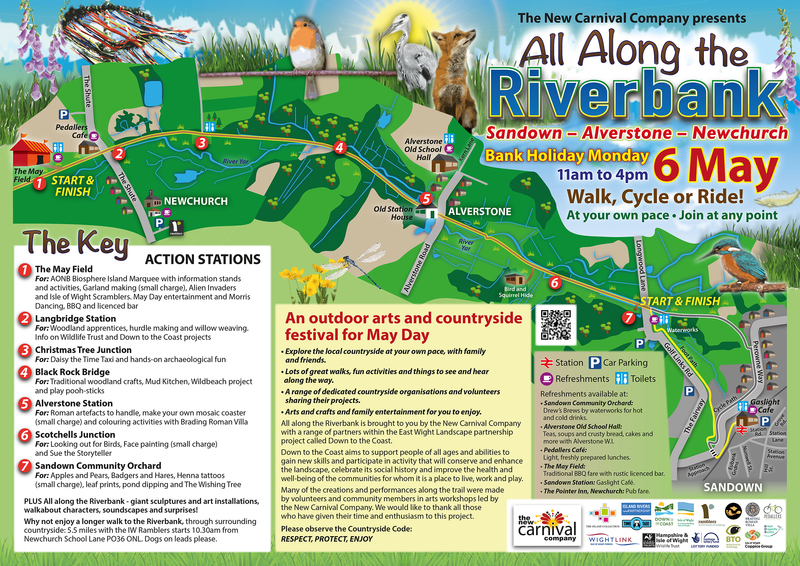 Environmental and arts organisations, activities, installations, guided walks, Morris and Maypole dancing. Teas and licensed refreshments. Walk it, ride it or cycle it! Come celebrate the Great Outdoors with us. Isle of Wight MARDI GRAS. BIOSPHERE ISLAND! Our annual flagship event, a fantastic 'carnival in education' parade of colour, costume, dance, music, energy. Created by local schools and community groups on themes and topics celebrating the best of our environmental, heritage and cultural assets. Part of our AONB partnered work linked to the Island's UNESCO Biosphere Reserve submission. If you would like to stay up to date with our latest news, please sign up to our newsletter below.